The information about integration problems for people (all age groups) moving to other countries. 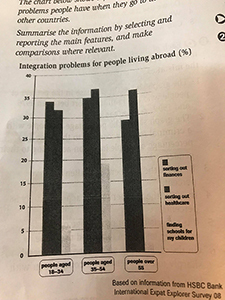 The chart gives us information about integration problems for people moving to other countries. The biggest problem of people aged 35 to 54 is sorting out finances which experienced by 35 percent in this group. Besides, the 18-34 age takes just less one percent than the 35-54 age. The proportion of people aged over 55 who have financial problems is 29 percent. Next to reducing healthcare, it's a significant number for the 35-54 age with the highest percentage in comparison with other ages (37% in group). This problem takes account for 32 percent for the youngest group and 36 percent for the oldest group. Contrary to the problems above, finding a place for their children to learn and be took care is not a major problem. Only 2 percent of people in the oldest group and 6 percent of the youngest group have difficulty. However, people aged 35-54 still suffer difficulties from seeking schools for their children, which takes 19 percent. In general, all age groups experience the same problems but specially, the proportion of sorting out healthcare is a major part and finding schools for their children is a minor part in all age groups. 1. On the first paragraph about what the charts illustrate, i think you can add more by mentioning what are the problems and what are the age groups represented. Hammy, the summary overview should identify the type of chart you are presenting. You cannot just say "chart" because there are several chart types used for the Task 1 essay. Be specific by indicating the actual chart being used. In this case, you should have said "The bar chart provided". The "bar" being the type of chart used. You must also summarize the types of information, and sources of information It is safe to say that you provided an incomplete summary overview and will lose points in terms of TA considerations because of it. Do this for the next 3 paragraphs since a concluding sentence / paragraph is not required in a task 1 essay. The only requirement is a truthful presentation of the information from the chart and proper analysis / explanation of the information provided to prove your English comprehension skills and English academic writing level. Do not be confused, the task 1 does not require a concluding statement, but it does ask you to provide a trending statement. What you wrote at the end is not a concluding statement but a trending statement. I am making this clarification because you keep asking the other members of this forum to write a concluding statement in your advice. That is wrong. The Task 1 essay requires a trending statement to be placed in any part of the 4 paragraph essay. The task 1 essay will never require a concluding statement because there is no discussion being presented, only an analysis of information previously provided for your writing reference. i'll notice and try harder. Home / Writing Feedback / The information about integration problems for people (all age groups) moving to other countries.